Quorum sensing (QS) is a chemical signaling mechanism that allows bacterial populations to coordinate gene expression in response to social and environmental cues. Many bacterial pathogens use QS to initiate infection at high cell densities. Over the past two decades, chemical antagonists of QS in pathogenic bacteria have attracted substantial interest for use both as tools to further elucidate QS mechanisms and, with further development, potential anti-infective agents. Considerable recent research has been devoted to the design of small molecules capable of modulating the LasR QS receptor in the opportunistic pathogen Pseudomonas aeruginosa. These molecules hold significant promise in a range of contexts; however, as most compounds have been developed independently, comparative activity data for these compounds are scarce. Moreover, the mechanisms by which the bulk of these compounds act are largely unknown. This paucity of data has stalled the choice of an optimal chemical scaffold for further advancement. Herein, we submit the best-characterized LasR modulators to standardized cell-based reporter and QS phenotypic assays in P. aeruginosa, and we report the first comprehensive set of comparative LasR activity data for these compounds. 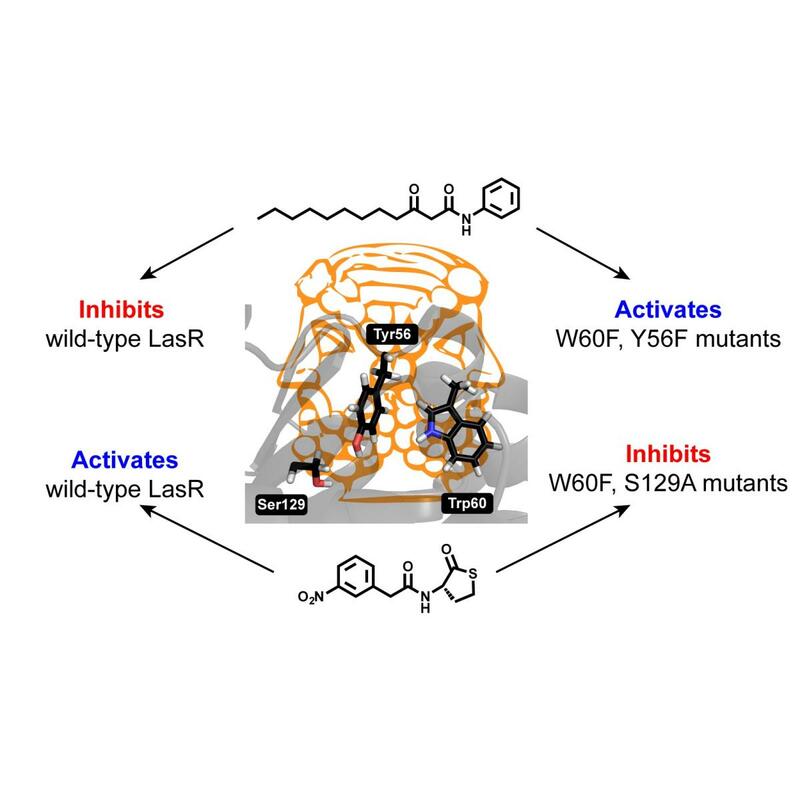 Our experiments uncovered multiple interesting mechanistic phenomena (including a potential alternative QS-modulatory ligand binding site/partner) that provide new, and unexpected, insights into the modes by which many of these LasR ligands act. The lead compounds, data trends, and mechanistic insights reported here will significantly aid the design of new small molecule QS inhibitors and activators in P. aeruginosa, and in other bacteria, with enhanced potencies and defined modes of action. Staphylococcus aureus uses short macrocyclic peptides (i.e., autoinducing peptides, or AIPs) to assess its local population density in a cell–cell signaling mechanism called quorum sensing (QS). At high cell numbers, this pathogen can initiate many virulent behaviors that allow for the establishment of infection. Binding of the AIP signal to its cognate transmembrane AgrC-type receptor is a critical event in the QS signaling cascade; consequently, interference of AIP:receptor interactions may have the potential to prevent and eradicate certain S. aureus infections. To date, four pairs of AIP:AgrC receptors have been identified in S. aureus, each pair being utilized by a specific S. aureus group (I–IV). Other staphylococcal species also use closely related, but distinct, AIP:AgrC pairs to control QS. We seek to develop non-native ligands capable of intercepting AIP:AgrC binding in each S. aureus group and in related species. As these bacteria may use their respective AIP signal to attenuate the QS systems of other groups/species, such ligands would provide valuable chemical tools to probe possible interference mechanisms in a range of contexts. In the current study, we used solution-phase NMR techniques to characterize the 3-D structures of a set of known native and non-native peptides that have differential modulatory activity in certain AgrC receptors. Analysis of these structures revealed several distinct structural motifs that belay differential activity in selected S. aureus AgrC receptors (i.e., AgrC-I, AgrC-II, and AgrC-III). The results of this study can be leveraged for the design of new synthetic ligands with enhanced selectivities and potencies for these AgrC receptors. Gram-negative bacteria use N-acyl L-homoserine lactone (AHL) quorum-sensing (QS) signals to regulate the expression of myriad phenotypes. Non-native AHL analogs can strongly attenuate QS receptor activity and thereby QS signaling; however, we currently lack a molecular understanding of the mechanisms by which most of these compounds elicit their agonistic or antagonistic profiles. In this study, we investigated the origins of striking activity profile switches (i.e., receptor activator to inhibitor, and vice versa) observed upon alteration of the lactone head group in certain AHL analogs. 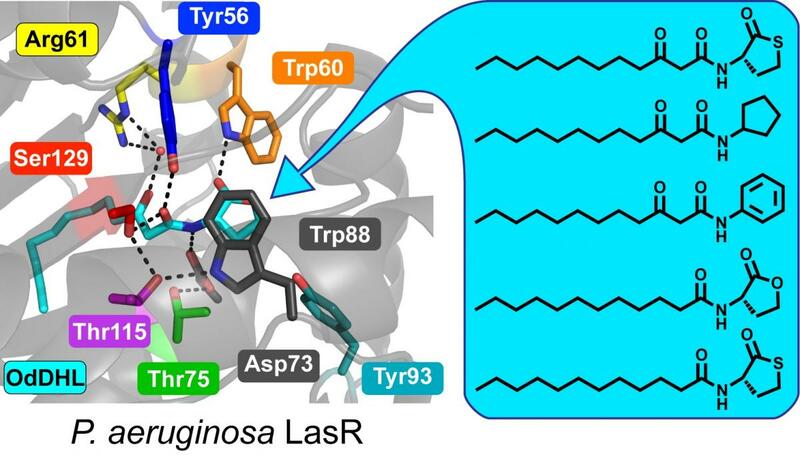 Reporter gene assays of mutant versions of the Pseudomonas aeruginosa QS receptor LasR revealed that interactions between the ligands and Trp60, Tyr56, and Ser129 govern whether these ligands behave as LasR activators or inhibitors. Using this knowledge, we propose a model for the modulation of LasR by AHL analogs—encompassing a subtly different interaction with the binding pocket to a global change in LasR conformation. Quorum sensing (QS) via the synthesis and detection of N-acyl L-homoserine lactone (AHL) signals regulates important pathogenic and mutualistic phenotypes in many bacteria. Over the past two decades, the development of non-native molecules that modulate this cell–cell signaling process has become an active area of research. The majority of these compounds were designed to block binding of the native AHL signal to its cognate LuxR-type receptor, and much effort has focused on LasR in the opportunistic pathogen Pseudomonas aeruginosa. Despite a small set of reported LasR structural data, it remains unclear which polar interactions are most important for either (i) activation of the LasR receptor by its native AHL signal, N-(3-oxo)-dodecanoyl L-homoserine lactone (OdDHL), or (ii) activation or inhibition of LasR by related AHL analogs. Herein, we report our investigations into the activity of OdDHL and five synthetic analogs in wild-type LasR and in nine LasR mutants with modifications to key polar residues in their ligand binding sites. Our results allowed us to rank, for the first time, the relative importance of each LasR:OdDHL hydrogen bond for LasR activation and provide strong evidence for the five synthetic ligands binding LasR in a very similar orientation as OdDHL. By delineating the specific molecular interactions that are important for LasR modulation by AHLs, these findings should aid in the design of new synthetic modulators of LasR (and homologous LuxR-type receptors) with improved potencies and selectivities. The opportunistic pathogen Pseudomonas aeruginosa uses three interwoven quorum-sensing (QS) circuits—Las, Rhl, and Pqs—to regulate the global expression of myriad virulence-associated genes. Interception of these signaling networks with small molecules represents an emerging strategy for the development of anti-infective agents against this bacterium. In the current study, we applied a chemical approach to investigate how the Las-Rhl-Pqs QS hierarchy coordinates key virulence phenotypes in wild-type P. aeruginosa. We screened a focused library of synthetic, non-native N-acyl L-homoserine lactones and identified compounds that can drastically alter production of two important virulence factors: pyocyanin and rhamnolipid. We demonstrate that these molecules act by targeting RhlR in P. aeruginosa, a QS receptor that has seen far less scrutiny to date relative to other circuitry. Unexpectedly, modulation of RhlR activity by a single compound induces inverse regulation of pyocyanin and rhamnolipid, a result that was not predicted using genetic approaches to interrogate QS in P. aeruginosa. 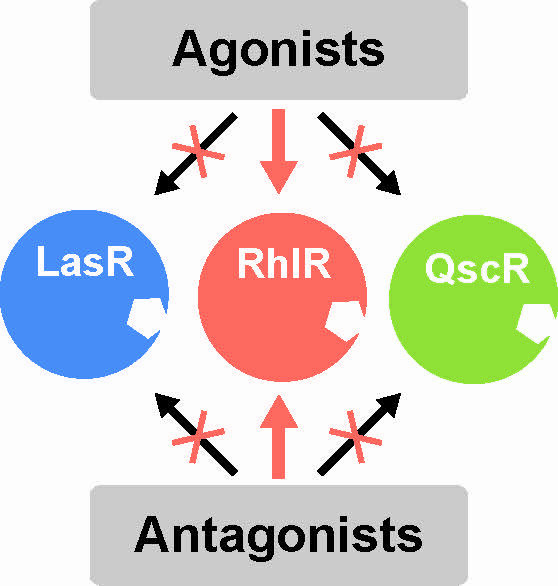 Further, we show that certain RhlR agonists strongly repress Pqs signaling, revealing disruption of Rhl-Pqs cross-regulation as a novel mechanism for QS inhibition. These compounds significantly expand the known repertoire of chemical probes available to study RhlR in P. aeruginosa. Moreover, our results suggest that designing chemical agents to disrupt Rhl-Pqs crosstalk could be an effective antivirulence strategy to fight this common pathogen. Materials and coatings that inhibit bacterial colonization are of interest in a broad range of biomedical, environmental, and industrial applications. In view of the rapid increase in bacterial resistance to conventional antibiotics, the development of new strategies that target nonessential pathways in bacterial pathogens—and that thereby limit growth and reduce virulence through nonbiocidal means—has attracted considerable attention. Bacterial quorum sensing (QS) represents one such target, and is intimately connected to virulence in many human pathogens. Here, we demonstrate that the properties of nanoporous, polymer-based superhydrophobic coatings can be exploited to host and subsequently sustain the extended release of potent and water-labile peptide-based inhibitors of QS (QSIs) in Staphylococcus aureus. Our results demonstrate that these peptidic QSIs can be released into surrounding media for periods of at least 8 months, and that they strongly inhibit agr-based QS in S. aureus for at least 40 days. These results also suggest that these extremely nonwetting coatings can confer protection against the rapid hydrolysis of these water-labile peptides, thereby extending their useful lifetimes. Finally, we demonstrate that these peptide-loaded superhydrophobic coatings can strongly modulate the QS-controlled formation of biofilm in wild-type S. aureus. These nanoporous superhydrophobic films provide a new, useful, and nonbiocidal approach to the design of coatings that attenuate bacterial virulence. This approach has the potential to be general, and could prove suitable for the encapsulation, protection, and release of other classes of water-sensitive agents. We anticipate that the materials, strategies, and concepts reported here will enable new approaches to the long-term attenuation of QS and associated bacterial phenotypes in a range of basic research and applied contexts. Many common bacterial pathogens utilize quorum sensing to coordinate group behaviors and initiate virulence at high cell densities. 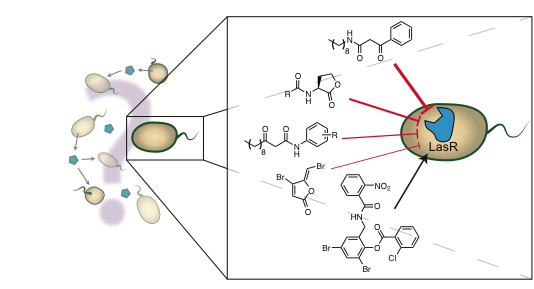 The use of small molecules to block quorum sensing provides a means of abrogating pathogenic phenotypes, but many known quorum sensing modulators have limitations, including hydrolytic instability and displaying non-monotonic dose curves (indicative of additional targets and/or modes of action). To address these issues, we undertook a structure-based scaffold-hopping approach to develop new chemical modulators of the LasR quorum sensing receptor in Pseudomonas aeruginosa. 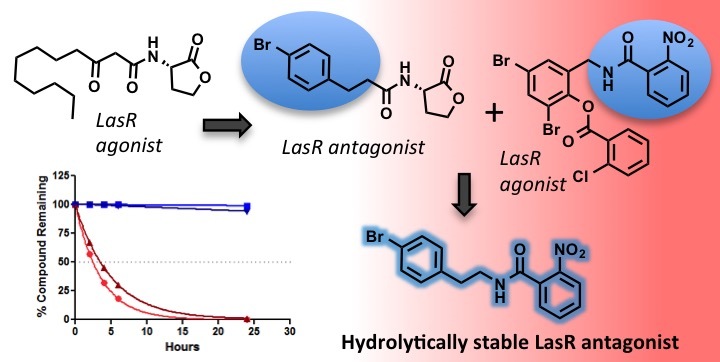 We combined components from a triphenyl derivative known to strongly agonize LasR with chemical moieties known for LasR antagonism and generated potent LasR antagonists that are hydrolytically stable across a range of pH values. Additionally, many of these antagonists do not exhibit non-monotonic dose effects, delivering probes that inhibit LasR across a wider range of assay conditions relative to known lactone-based ligands. Pseudomonas aeruginosa uses N-acylated L-homoserine lactone signals and a triumvirate of LuxR-type receptor proteins—LasR, RhlR, and QscR—for quorum sensing (QS). Each of these receptors can contribute to QS activation or repression and, thereby, the control of myriad virulence phenotypes in this pathogen. LasR has traditionally been considered to be at the top of the QS receptor hierarchy in P. aeruginosa; however, recent reports suggest that RhlR plays a more prominent role in infection than originally predicted, in some circumstances superseding that of LasR. Herein, we report the characterization of a set of synthetic, small-molecule agonists and antagonists of RhlR. Using E. coli reporter strains, we demonstrated that many of these compounds can selectively activate or inhibit RhlR instead of LasR and QscR. Moreover, several molecules maintain their activities in P. aeruginosa at concentrations analogous to native RhlR signal levels. These compounds represent useful chemical probes to study the role of RhlR in the complex QS circuitry of P. aeruginosa, its direct (and indirect) effects on virulence, and its overall merit as a target for anti-infective therapy. The Blackwell Lab located in the Chemistry Department at the University of Wisconsin – Madison works at the interface of chemistry and biology. 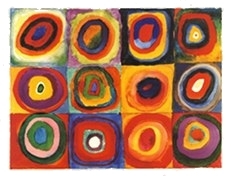 See Research for an overview of our group's current research directions and Publications for work we've already published. In partnership with Sigma-Aldrich, several of the lab's lead modulators of LuxR-type quorum sensing receptors are now available for sale! We welcomed four new students to the Blackwell lab! Cassie Doody and Tom Polaske join us from the chemical biology path, and Maggie McEwan and Ke (Kate) Zhao join from the organic chemsitry path. Welcome aboard! Our very own Joseph has been selected to attend the 2018 Summer ACS Division of Organic Chemistry Graduate Research Symposium. This is a huge honor and one Joseph should be proud of. Way to go Joseph! Congratulations to Helen! For her immense commitment to mentoring and teaching students within the Chemistry department, the GSFLC have awarded her a 2018 GSFLC Mentor Award! Great job, Helen! Please join me in congratulating our very own Stephen Early in being awarded not only a Hilldale Undergraduate Fellowship (the most prestigious fellowship given to undergraduates by UW), not only a Chemistry Department Scholarship, but also a Honors Senior Thesis Grant! Way to go Stephen! Wow! Wenqi is the winner of not one, two, or three scholarships, but four scholarships! Three from the Chemistry Department and 1 from Biochemistry. These funds will support her over the summer and in the fall. Many congratulations Wenqi!